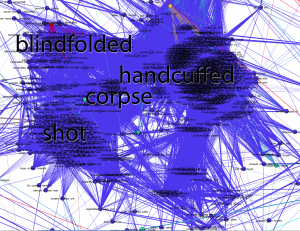 Update (Apr 2012): the exploratory work described in this post has since blossomed into the Overview Project, an open-source large document set visualization tool for investigative journalists and other curious people, and we’ve now completed several stories with this technique. If you’d like to apply this type of visualization to your own documents, give Overview a try! 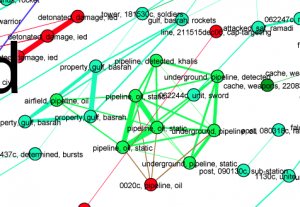 Last month, my colleague Julian Burgess and I took a shot a peering into the Iraq War Logs by visualizing them in bulk, as opposed to using keyword searches in an attempt to figure out which of the 391,832 SIGACT reports we should be reading. Other people have created visualizations of this unique document set, such as plots of the incident locations on a map of Iraq, and graphs of monthly casualties. We wanted to go a step further, by designing a visualization based on the the richest part of each report: the free text summary, where a real human describes what happened, in jargon-inflected English. Also, we wanted to investigate more general visualization techniques. At the Associated Press we get huge document dumps on a weekly or sometimes daily basis. It’s not unusual to get 10,000 pages from a FOIA request — emails, court records, meeting minutes, and many other types of documents, most of which don’t have latitude and longitude that can be plotted on a map. And all of us are increasingly flooded by large document sets released under government transparency initiatives. Such huge files are far too large to read, so they’re only as useful as our tools to access them. But how do you visualize a random bunch of documents? We’ve found at least one technique that yields interesting results, a graph visualization where each document is node, and edges between them are weighted using cosine-similarity on TF-IDF vectors. I’ll explain exactly what that is and how to interpret it in a moment. But first, the journalism. We learned some things about the Iraq war. That’s one sense in which our experiment was a success; the other valuable lesson is that there are a boatload of research-grade visual analytics techniques just waiting to be applied to journalism. This is a picture of the 11,616 SIGACT (“significant action”) reports from December 2006, the bloodiest month of the war. Each report is a dot. Each dot is labelled by the three most “characteristic” words in that report. Documents that are “similar” have edges drawn between them. The location of the dot is abstract, and has nothing to do with geography. Instead, dots with edges between them are pulled closer together. 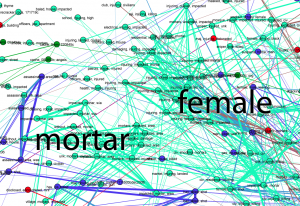 This produces a series of clusters, which are labelled by the words that are most “characteristic” of the reports in that cluster. I’ll explain precisely what “similar” and “characteristic” mean later, but that’s the intuition. We colored each report/dot by the “incident type”, which is an existing field in the SIGACT, entered by military personnel. It’s important to note that the incident type field was not used to place the reports in the diagram — the placement depends only on the text of the document. This plots one one variable (color, which is incident type) against another (position, which depends on the summary text). Above this, the blue murders merge into the green “enemy action” reports. At the interface we have “civ, killed, shot,” which are apparently reports of civilians wounded in battle. Enemy actions also have their own clusters labelled with “mortar,” “female,” “officer,” and “injured.” We haven’t looked into the “female”/”enemy action” cluster yet, and I wonder if there’s a story there. There is a red cluster off to the side. Red signifies that the military coded these reports as “explosive hazard,” and the documents here all include the words “tanker truck.” Sure enough, there are contemporaneous press reports of tankers being used as explosive weapons, and this cluster shows that there were at least several dozen such incidents throughout Iraq in Dec 2006 — though it doesn’t immediately distinguish between explosions and attempted or threatened explostions. 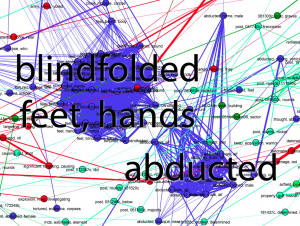 There’s another cluster of blue criminal action reports, labelled “blindfolded, feet, hands.” Bound feet and hands were common in sectarian violence at the time, and some reports include the word “torture.” There’s a nearby cluster of abductions. Visualization is metaphor. Certain details are thrown away, other are emphasized. 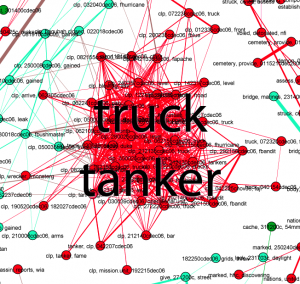 The algorithms used to produce the visualization have their own sensitivities and blind spots. Without understanding these, a viewer will make false inferences. I’m going to explain in some detail about how this picture was produced, both so that others can replicate this research, and so that those looking at such visualizations can interpret them honestly. We used standard text-analytics techniques, borrowed from information retrieval: the bag-of-words model, TF-IDF term weighting, and cosine similarity to compare documents. This is the stuff from which search engines are built, among other things. The geeky among us can learn as much as they could ever want to know from this wonderful free information retrieval textbook. We start by turning each document into a fixed-length vector of numbers. There are as many numbers in this vector as their are words in the vocabulary of all the documents, over 17,000 distinct terms in the case of the Iraq War Logs. If “pipeline” appears three times in a report, we put a three in the count for “pipeline.” Of course the reports are much shorter than 17,000 words, usually just a couple hundred words, so most of the numbers in each document vector are zero. We also don’t quite store the count of each word. Instead we store the frequency, that is, we divide the counts by the number of words in the document. If the document is 100 words long then “‘pipeline’ appeared three times” becomes “3% of the words in this document are ‘pipeline. '” This is “term frequency,” the TF part of TF-IDF. Then we normalize again by how commonly the word appears across documents. It’s not enough to know that “pipeline” is common in a document.” We need to know that “pipeline” is unusually common in this document. So we count the fraction of documents where “pipeline” appears, and divide the term frequency by this document frequency. (Technically, by the logarithm). This has the effect of de-emphasizing terms which appear in almost every document, and it’s the “inverse document frequency” or IDF part of TF-IDF. This is the sense in which that the labels on the documents and the clusters are “characteristic” words: they are words that occur frequently in those specific documents, but don’t appear at all in most other documents. Important caveat #1: any visualization based on a bag-of-words model cannot show distinctions that depend on word order. Each document is a dot in the visualization. To this we add edges, and the “weight” or strength of the edge — which shows up as line width in this visualization — is the cosine similarity. But we don’t put edges between every pair of documents, only those that are above some threshold of similarity. For this visualization, that threshold was 0.6. And then we lay out the graph. 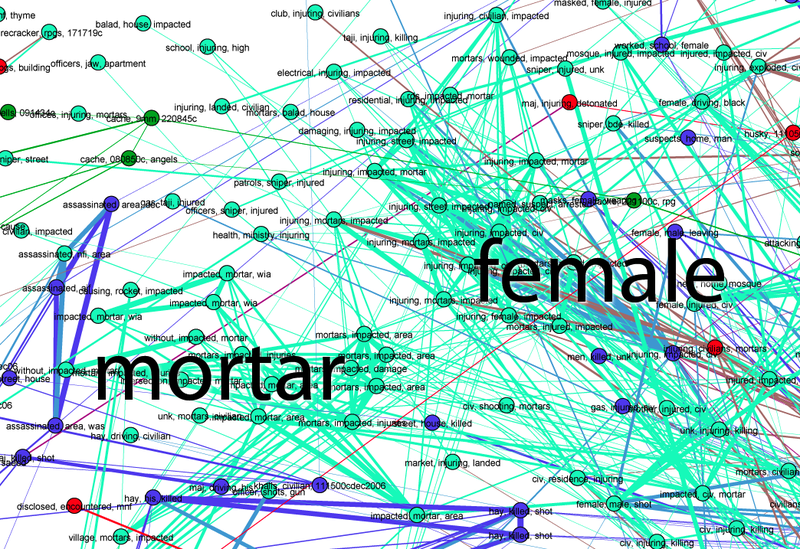 We used Gephi, a free graph visualization tool. 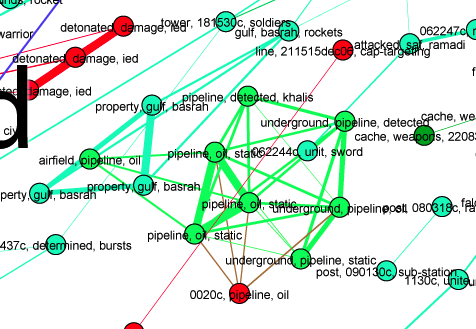 Generally, graph layout algorithms try to bring nodes with strong edges closer together. We found the Fruchterman-Reingold algorithm gave the clearest layout in this case, but the general idea is that points with strong ties gradually move closer as the algorithm runs. But there are conflicting demands; a node marked “corpse” and “abducted” may be pulled towards both clusters. 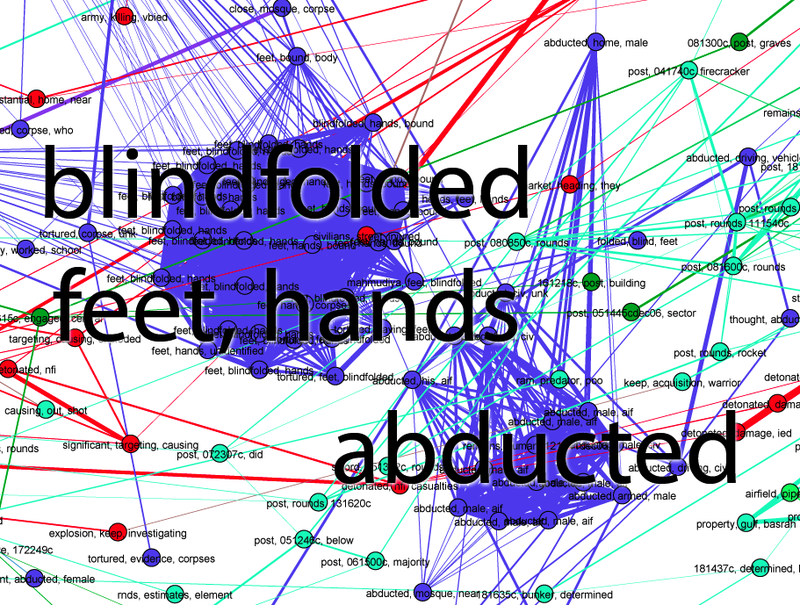 Where a node ends up also depends a lot on where it started, and the nodes start in essentially random positions. Important caveat #2: the positions of the dots are sort of arbitrary, though we hope that nearby dots actually represent similar documents. In other words, quantitative measurements of distances on this visualization won’t mean much. Arguing that “these events are unrelated because they are on opposite sides of the image” is similarly fallacious. What can we learn from this visualization technique? Clusters are fairly reliable structures. Using color to plot one type of information against another can reveal patterns. 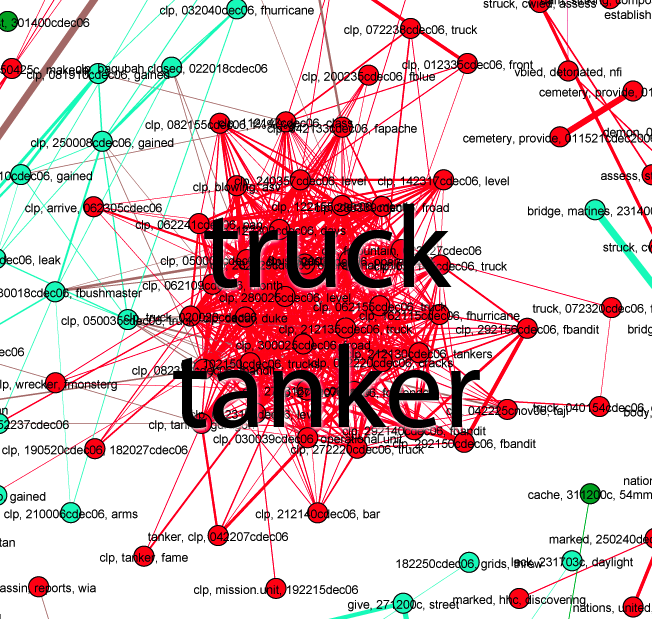 And we believe that this visualization captures some important macro-scale aspects of the War Logs. This picture isn’t a story in the usual sense, but we find it insightful nonetheless, and maybe it tells us where to look further. A search tool only can only answer the questions we ask, but a visualization tool lets us make maps. To begin with, we’d like to try coloring each dot according to the number of casualties, another field already available in the SIGACTs. We know that over 4000 U.S. forces and 100,000 civilians died in Iraq, but what were the circumstances of their deaths? Perhaps we can start to answer that question. We also want to find a way to animate this diagram through time, so we can see how the war changed as it progressed. But there are plenty of other visualization techniques waiting to be applied to journalism, and plenty of other document sets to apply them to. It seems likely that TF-IDF and cosine similarity will be generally useful for full-text visualizations of a variety of document types, but it won’t always work. Threaded displays might be much more revealing for things like emails, where it’s important to identify and isolate conversations. In other contexts, entity-relationship diagrams can be insightful; theyrule.net is the granddaddy of this type of analysis, today being seriously pursued by Muckety. Visualization is also only one part of the problem. This is a static image, but what we really need is an interactive system where a computer draws the pictures and a human directs the exploration. Visualization has to be combined with filtering and selection tools to allow an investigator to “zoom in” on only those documents of interest. Such complete systems exist in other fields, such as the Jigsaw visual analytics software, but there’s currently nothing that really works well for journalism. Performance is a huge issue when dealing with very large document sets, and data import and clean-up are often the real-world bottlenecks. Clean-up is often the most time consuming part of document set analysis, and new tools such as Google Refine give us hope that it can be streamlined. 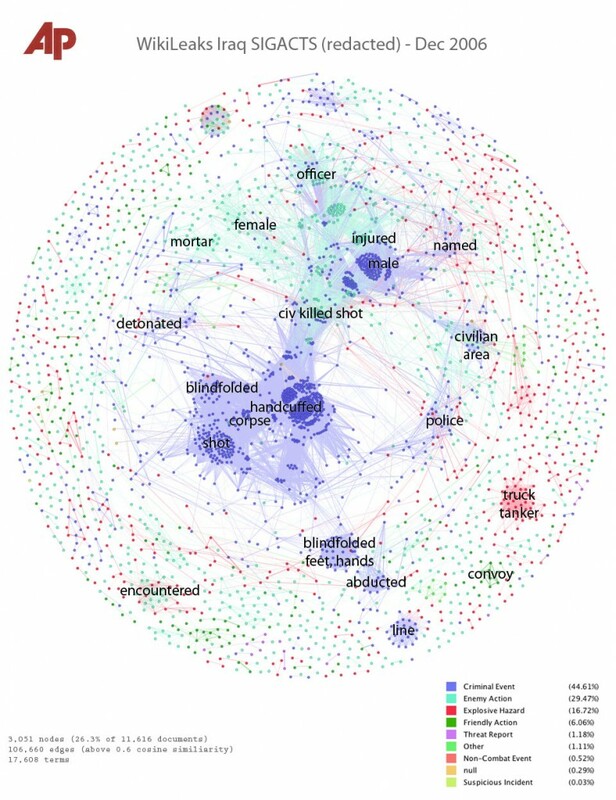 The potential applications of an industrial-strength journalistic visual analytics system are far broader than document dumps. We got interested in visual analytics because we faced document sets that were so large that they were completely opaque without special tools. But a newsroom also has its archives, and the data and stories it generates every day. We’ve heard interest from historians, and at the other end of the immediacy scale are potential real-time monitoring applications, technologies that are being seriously pursued by organizations such as UN Global Pulse. We see so much potential that we — the Associated Press in conjunction with several top-notch researchers — are embarking on a serious attempt to build an open-source system for journalistic visualization of very large document sets, be they document dumps, news archives, or the streams of data that now surround civilization. We have preliminary designs for a system called Overview, and we have applied for a Knight News Challenge grant to hire full-time developers to create it. I’ll soon post a more detailed description of the system we’d like to build. We’re going to need help from the journalist-programmer community. Very nice breakdown. Despite the limitations, I think this project has serious merit in terms of overall data comprehension. Just as doctors use multiple tests and historians multiple sources, journalists, too, need multiple tools in order to acquire an appreciable grasp of what the data means. The animation feature, for me, is one of the best ideas for further development, as it would be too easy otherwise to mistake a moment for its significance without the proper understanding of the events before and after. I hope the project is funded, but if it is not are there plans for development sans grant? This is extremely impressive; amazing work guys! Excellent work, and similarly excellent writeup. This post sent me off on a three-hour Wikipedia and related reading bender. Did you end up implementing your own TF-IDF and similarity calculations, or were there tools available to assist with that portion of the gruntwork? Julian Burgess wrote our TF-IDF and cosine similarity code in Ruby. They’re pretty straightforward algorithms, though you have to be careful in certain ways if you want good performance on big data sets (e.g. document vectors must be stored in sparse representation.) Ruby is also a terrible language for high-performance software. We’re investigating our options for the production system. Good work! I look forward to reading more. If your interested in hearing about my stories as an Iraq Veteran my website is http://www.warriorbain.com. Jonathan, nicely done! And a very clear explanation as well, thanks. As Jeremy notes in the comment above, this can be a very useful tool in a big toolkit of tools that newsrooms can use. A couple of quick questions: 1. How long did it take/does it take to prep the data and send it through the algorithm? 2. How much training will it take for your average but data-savvy journalist to understand how to use this well? 3. Is the visualization interactive? Can I dive into a cluster and look at individual reports? This image took about two weeks to create, but most of that was working out the technique. We could do another one — another month in the war, say — in a day or two. It’s a bit awkward because we’re working with prototype tools and code. The actual processing time is minimal, an hour at most. As you suggest, eventually we hope to have an interactive system which will allow the production of this type of visualization, and others, on deadline. Zooming in, clicking on individual reports, linked selection between different types of displays would all be useful tools. As far as training, I hope I’ve been able to get across the key points of how to interpret this picture in the post above. Using this type of system will be a little different than what CAR reporters traditionally do, but I’d imagine that it would be possible to get to a basic fluency in a day of training. How long it would take to become expert, I can’t say — we’ll find out when these tools are in the hands of many more people. I just watched your talk on this and it was excellent. Thanks for all the hard work and for making this available to the rest of us! Reading this article, you can just see the potential for very useful tools in the future. Maybe I missed it, but I’m wondering how the visual was presented to readers/subscribers when it was first developed. Was there a story with it? Or the map with info on how to read it? That was an incredible job Jonathan. It gives a much clearer insight to the plights of the Iraqi war. Data journalism definitely shows a much broader picture than just words. Thank you.